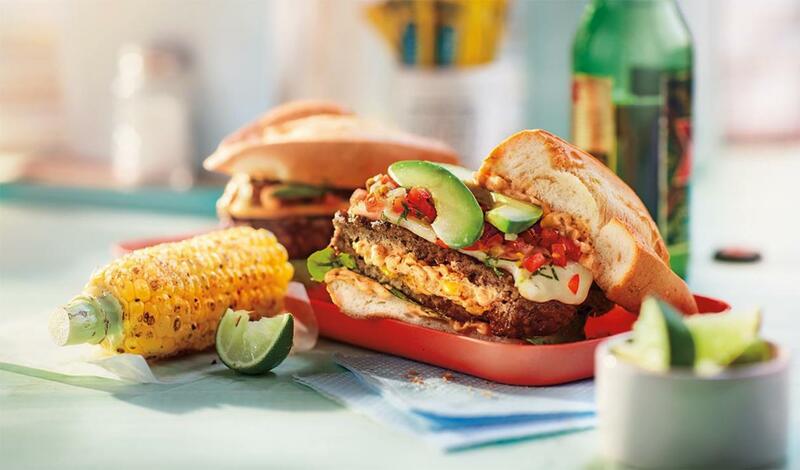 A ground beef patty spiced up with corn and taco cream cheese stuffed inside, then topped with pico de gallo, Muenster cheese, avocado, jalapeno and taco mayo. Pickled Red Onion 1 T.
Create a stuffed patty by sealing 6 oz. ground beef around 2 T. Taco Cream Cheese. Grill until cooked through. Top with cheese. Spread Taco Mayo on both sides of the bun. Build burger with remaining ingredients.